Pembroke Dental Ballsbridge discusses what teeth whitening method gets the best results. If you’re conscious about the off-white colour of your teeth, you might be at the stage where you’re considering teeth whitening. If this is the case, you’re far from alone. More and more people are opting to pay for bright, white teeth. It’s one surefire way to boost your self-esteem and face the world with renewed confidence. As technology advances and new discoveries are made, our teeth whitening options grow. There are many different ways to brighten your teeth — but not all options are good ones. What’s more, an effective method for one person might not work at all for another. To prevent you from becoming overwhelmed with the possibilities, your favourite dentists at Dublin D4 have laid out all the facts and done all the groundwork so you don’t have to. Below, we’ll explore what teeth whitening method is best. What Are the Most Popular Forms of Teeth Whitening? On top of the products named above, some people decide to opt for porcelain veneers. Though this is a more expensive option, it is highly cost-effective in the long-run, so dental veneers are certainly a good alternative for anyone willing and able to invest. Should I Rely on Teeth Whitening Charcoal? Some people swear by activated teeth whitening charcoal. However, there is no evidence to suggest this form of teeth whitening works at all. In fact, some experts suggest that what some perceive as instant whitening by the product is simply an optical illusion — your teeth are likely to look pearly white when the minute before they were covered in a dark and grainy film. What’s more, activated charcoal is not cheap. As it grows in popularity, so too does its price. Rather than spending a substantial amount of money over the course of a few months, it would be better to save your money and opt for a method that is proven to produce results. Is Laser Teeth Whitening a Good Option for Me? Laser teeth whitening works by soaking the teeth in a whitening solution that penetrates the teeth and breaks up stains, thereby making teeth appear whiter. A laser activates this whitening solution. Following laser teeth whitening, some people find that their teeth are more sensitive, while others experience gum irritation. Here at Pembroke Dental Ballsbridge, we don’t recommend laser teeth whitening as an option due to the shorter-term nature of the results and the negative side-effects on the teeth. What might at first appear to be brilliant results can fade within three days of laser teeth whitening. Should I Buy a Teeth Whitening Kit Online? Buying a teeth whitening kit online is one of the most pressing dangers in this field, due to the fact that you never know exactly what you’re getting when you order online. The product might be something that is at best ineffective — and at worst, harmful. Whitening gel is a prescription product that can only be used under a controlled setting, with strict supervision by an experienced dentist who can recommend the strength and quantity of gel to be used. Importantly, dentists can also provide bespoke gum shields that keep the whitening gel where it needs to be. With low-quality “boil and bite” gum shields, you run the risk of the whitening gel running and damaging the soft tissues of your gums, which can be extremely painful. But here’s what you should really know before you buy a tooth whitening kit online — you might not actually be suitable for teeth whitening at all. This means you are not only wasting your money, but you could end up highlighting darker-coloured restorations and crowns, which won’t give a good aesthetic result. Does Teeth Whitening Toothpaste Work? You might have spent a lot of money on teeth whitening toothpaste over the years, but you might have also occasionally paused to wonder — do teeth whitening toothpastes actually work? The truth is, while whitening toothpaste can appear to whiten teeth slightly by removing surface stains, such products can’t change the natural colour of your teeth or remove a stain that runs deeper than the surface of a tooth’s enamel. Because whitening toothpastes don’t contain peroxide, they generally work by using certain abrasives to scrub away stains. Other toothpastes use chemicals to help break down these marks. Others still use solutions including covarine, which sticks to the surface of your teeth and, through an optical illusion, makes your teeth appear less stained. So although teeth whitening toothpastes aren’t likely to do damage to your teeth, they are also far from an effective long-term solution if you are looking for a dazzling white smile. Why Does Pembroke Dental Ballsbridge Recommend Philips Zoom Whitening Gel? Though there are a lot of products to choose from, as experts in the field, we have chosen the industry-leading Philips Zoom DayWhite and NiteWhite whitening gel for use in our Dublin D4 dental office. The whitening gel is highly effective and prescription strength, meaning it can only be prescribed by a qualified dentist. We create in-house, bespoke fitted trays, which are designed to adapt perfectly to your teeth. This means the gel is held comfortably in place when applied, greatly decreasing the odds of sensitivity and improving the results. We offer our patients take-home whitening kits for the best long-term results. To find out how Pembroke Dental Ballsbridge can help you whiten your teeth and give you an added dose of confidence, book an appointment at our Dublin D4 dental office today. Clear, invisible aligners are a great alternative for anyone wanting to avoid adult braces. Here, we explore what Invisalign is and how they can give you a perfect smile. Smiling is the most natural thing in the world — and yet, there are a huge number of people who find grinning in public or in photographs so daunting they deliberately hide their teeth. According to a recent survey, more than a third of adults in the UK hate their teeth and believe the state of their smiles has held them back in life — notably with regards to their personal lives and their careers. The same survey found that teeth came third in a list of things we stress about most in life — tailing closely behind finances and relationships. One in five says that as a result, they are becoming more introverted. Exposing their pearly whites has become a source of insecurity and shame for many, but thankfully we have a solution for the cautious smilers of the world — it comes in the form of invisible braces, otherwise known as Invisalign. According to a recent survey, Dublin dentist can help you with your smile makeover. What Is Invisalign? How Do Clear Braces Work? Put simply, Invisalign (sometimes referred to as clear aligners) are clear braces that are at the forefront of cosmetic dentistry technology. They are a method of teeth straightening that is virtually invisible, distinguishing them from more traditional metal braces. Invisalign is custom-made with SmartTrack material, and they are designed to fit your teeth and gradually reposition them over time. Invisalign fits comfortably over your teeth and are clinically proven to improve control of teeth movement. Every three or four weeks, you will need to visit your dentist for a new set to get your teeth to straighten into their ideal position. Any of the conditions above could cause further complications, so it is best to resolve the problem as soon as possible. What Is the Procedure for Invisalign? The first step of getting Invisalign starts with a trip to Pembroke Dental, your favourite Dublin dentist. We begin by making an impression of your teeth. We then move on to evaluating your smile and mapping out a customised digital treatment plan so that you can visualise the ultimate results. We then ask you to approve your custom plan, and we begin to craft your unique aligners using the mould of your teeth. We ask you to wear each set of aligners for up to twenty-two hours a day, and we change your set of Invisalign aligners every few weeks, depending on your particular needs. The results will be comfortable and seamless, and in no time at all, your teeth will shift into place and you’ll be left with a dazzling new smile. Once I Have Invisalign, How Often Do I Need to See My Dentist? Our Dentist here in Dublin 4, Doctor Keenan, will schedule regular Invisalign appointments for you — usually about once every three or four weeks. These dental visits are to ensure your Invisalign treatment is progressing as planned and you are on track to your perfect smile. The whole process usually takes up to eighteen months to complete, although this could be longer, depending on the severity of misalignment or other dental issues you may have. Why Should I Pick Pembroke Dental for My Invisalign Needs? Here at Pembroke Dental, we’re committed to excellence and customer satisfaction. We have built our reputation around happy customers, and we have a wealth of glowing customer testimonials to put your mind at ease. At Pembroke Dental, we’re happy to answer any questions you might have. We also offer a free dental consultation. On top of this, to help you on your way to your Hollywood smile, we offer interest-free payment plans, so you can spread the cost of your clear braces over a period of time that is comfortable for you. We do this because we believe everyone is entitled to a perfect set of pearly whites — and your favourite Dublin D4 dentist can help you on your way. If you would like to make a free, no obligation Invisalign appointment in Dublin, get in touch with our team today. We’ll evaluate your options and give you our honest opinion on whether we believe clear braces are right for you. Anyone who lives or works in Ballsbridge like we do will tell you what a wonderful, thriving place it is. There’s so much to do, so many services and so many places to eat, drink and play! With lots of companies relocating to Ballsbridge, and new residents and workers coming in to the area, the new Ballsbridge Living website is a wonderful resource for finding out more about life in Dublin 4, including where to avail of essential services like dentistry – here at Pembroke Dental Ballsbridge, of course! 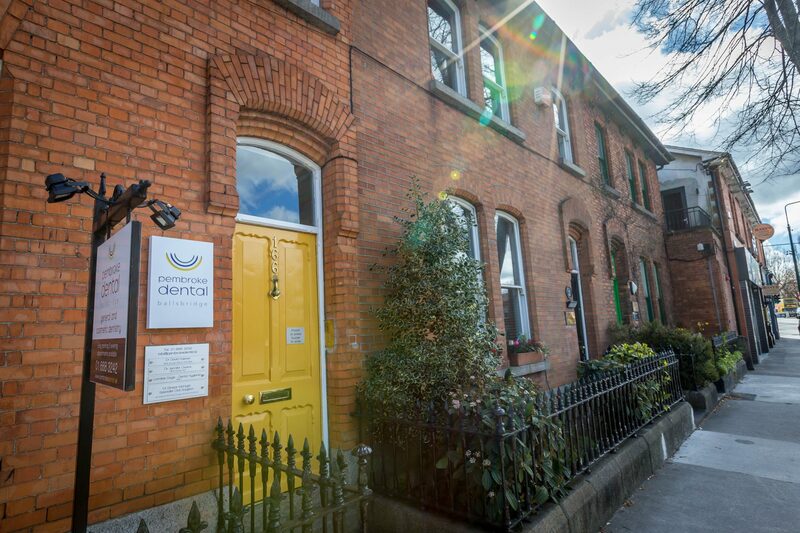 Pembroke Dental Ballsbridge has been at the heart of the community in Dublin 4 for three generations. In the past twelve months we have expanded with the locality, adding two new surgeries, more state-of-the-art dental equipment and extended clinic hours. We continue to provide the best general and specialist dental care to new and existing patients, in a location which couldn’t be more convenient – just opposite the US Embassy. For more information about Pembroke Dental Ballsbridge or to make an appointment, call 01 668 3242. For information on the area, visit the Ballsbridge Living website. If you’re interested in dental implants, you’ll want to be as informed as possible. Below we’ve compiled commonly asked questions about dental implants. At Pembroke Dental, we offer a number of dental treatments. One of the most popular of our services is dental implants, which patients often opt for if they want to replace a missing tooth. We perform dental implants every day at our dental practice, so we are very familiar with the process, what it entails and how to best look after them. But we also realise if you are someone new to the idea of dental implants, you likely have a thousand and one questions — and the sooner you get the answers, the better! Put simply, a dental implant is a threaded titanium metal rod that is placed into the jawbone. This rod is used to support one (or more) false teeth, whether fixed or removable. The rod and false teeth are both referred to as “dental implants” and the replacement teeth are made to match your natural teeth, giving you a natural, confident smile. Dental implants can, of course, improve your appearance greatly, but can also help with your speech, make you more comfortable, facilitate eating and boost your self-esteem. Dental implants can even improve your oral health. 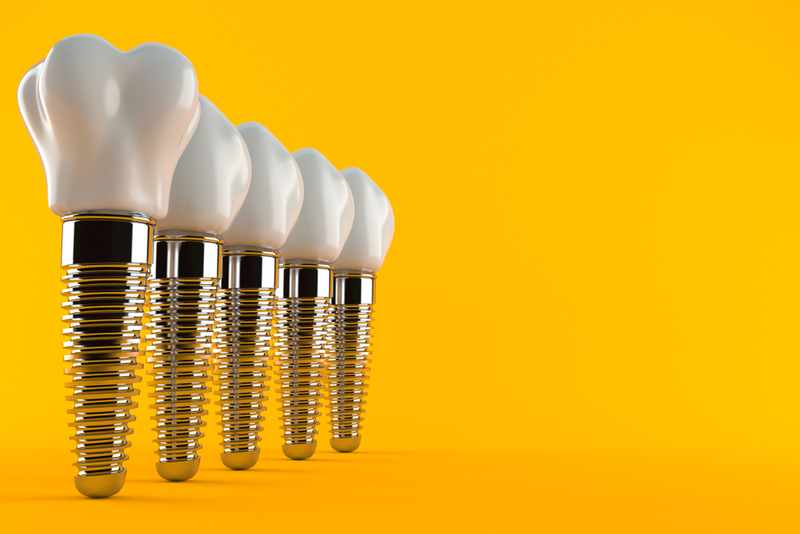 When Are Dental Implants a Good Idea? Should I Get a Dental Implant? Your dentist will likely suggest dental implants if you are missing a tooth or a series of teeth. This is because a missing tooth can do more than just give you a gappy grin — it can cause a great number of problems including shifting, as well as problems chewing or eating. You will be eligible for a dental implant as long as you have a strong jaw bone, which is more likely if you are younger, as over time bone wears down and decays. Sometimes, patients might require a bone graft before they can undergo the process of a dental implant. If you’re looking to get a full set of dental implants, you maybe are concerned about how much dental implants cost. Unfortunately, dental implants can be expensive, but in most situations, the cost of a dental implant is only slightly more than the cost of a more conventional treatment involving crowns and bridges. You should factor in that dental implants are more cost-effective in the long term, and offer better results — it has been shown that dental implants cause less disruption to your speech than traditional dentures. Dental implants should be thought of as an investment that will hold up over time. No, dental implants do not get cavities. The implant-restored crown is made with an artificial material, and for this reason, it cannot grow cavities. Having said that, you still need to take great care of your dental implants. Have regular gum care and cleanings around the implant site to keep your implants in top condition. With the right care, your dental implants should last for upwards of forty years. They are a tried-and-tested treatment and can even last a lifetime if you regularly brush, floss and follow your dentist’s recommendations. These will vary from your dentist depending on your genetic history (for example, whether certain diseases run in your family) and your nutritional habits. What Is the Dental Implant Success Rate Like? Can the Human Body Reject an Implant? The success rate is very good for dental implants. Strictly speaking, implants can’t be rejected since they do not contain any living cells. On top of this, titanium is biocompatible and allergies are very rare. Having said this, dental implants can fail to integrate with the jaw bone when an infection develops. This can happen if you’re not taking good care of your dental hygiene. Don’t worry, though — this is very rare, and in 95% of cases, you should have a healthy dental implant that will last years. No, not at all. Dental implants are typically placed under local anaesthesia, given that the process means a small operation. On occasion, patients can be sedated if they are particularly nervous. In more complicated cases, your dentist might use a general anaesthetic, but you will never feel any pain during the procedure. You might feel some discomfort in the week following the surgery while you begin to heal. Most patients find they can easily manage pain by taking over-the-counter remedies such as paracetamol and ibuprofen. Yes, dental implants are entirely safe and have been used for a long time. Technology has evolved, so dental implants are now highly sophisticated devices designed by very well trained professionals. They are the strongest, and most reliable, way of replacing missing teeth. However, as with everything in life there are risks involved, although rare. You might get an infection on the implant site. You might also suffer an injury to one of the surrounding structures, such as a blood vessel, nerve or adjacent tooth. Nerve damage might result in pain, numbness or tingling. Be sure to talk to your dentist if you are concerned. After an initial consultation, your dentist will be able to give you a rough timescale for how long the treatment will take. Placing a single dental implant might take as little as 30 minutes, but a more complex surgery might take up to four hours. You will then be asked to go home while the implant heals and properly fuses to your jawbone. Then, several months later, your dentist will fit the cap or crown. In all, the process should take a maximum of 8 months, unless more complicated surgery is required. If you don’t feel dental implants are right for you, or if you are unable to have dental implants for a medical reason, there are alternatives. Some of these include full mouth dentures, partial dentures and fixed bridges. However, if at all possible, we’d always recommend dental implants as the most effective solution. You need to take care of your dental implants in much the same way you take care of your existing teeth. Schedule regular checkups with your dentist, floss and brush and eat a nutritious diet to give your dental implants a good chance of lasting a lifetime. What Are the Odds of Dental Implant Failure? The success rate of dental implants averages about 95%, although this can change from individual to individual, depending on your particular situation. When compared to non-smoking patients, dental implants in smokers are 4 times as likely to fail. Smoking often leads to gum recession and gum disease, which weakens the implant structure. Dental implants are a great investment. They look so natural that no one will be able to tell they are artificial, and they give you the confidence and comfort you’ve been looking for. Your dentist will match your replacement teeth to the shape and colour of your existing teeth. It’s remarkable what a new smile can do — you’ll be left feeling younger and happier than you have in years. Pembroke Dental & Implant Centre is a family practice. We offer high-quality cosmetic surgery at reasonable prices. Get in touch today for a dental consultation. Dental implants are a treatment to replace teeth that are missing due to fracture, infection or decay. Still, we’re often asked by our patients if having dental implants can reduce the occurrence of tooth decay, gum disease or other dental related problems. Continue reading to find out more. Maintaining dental health is an essential step toward preventing common diseases associated with the teeth. Some of the common tooth problems that affect people are gum disease, tooth decay and tooth loss. Are dental implants a potential solution? Let’s first look at the advantages of dental implants and how they might be used to solve dental problems. Dental implants are best described as a kind of replacement tooth. Dental implants are usually fitted by a dentist that specialises in implants. Unlike other tooth replacement methods, such as bridges and dentures, dental implants are difficult to tell apart from your natural teeth. Gum disease is caused by an accumulation of bacteria in the mouth that can cause your gums to become swollen. Mild gum disease can be treated by brushing and flossing, but it’s always best to check with your dentist if you suspect that you might have gum disease. Severe gum disease is a much more serious issue which could eventually lead to tooth loss. Gum disease is thought to be a leading cause of tooth loss in adults. Dental implants aren’t a technique for preventing gum disease, but you could use a dental implant to replace a tooth lost to gum disease. Of course, it’s far better to practice good dental hygiene and avoid tooth loss in the first place if possible. Dental implants allow patients to bite and chew favourite meals without worrying if the food will stick to their implants. This is because dental implants are securely fastened to your mouth and can be cleaned just like your regular teeth. If you do lose a tooth, it’s very important to be aware of the danger of bone loss. This is when the remaining jaw bone underneath the lost tooth withers away. This can lead to an array of potential complications, including infections. Dental implants can help to prevent bone loss. The jaw bone will fuse with the dental implant and, if everything is done correctly, the risk of bone loss is minimised. If you are worried about tooth loss or bone loss it’s always best to talk to a dentist. It’s almost impossible to differentiate between a good dental implant and a natural tooth. After an implant is fitted, it’s carved in a manner that makes it looks exactly like an original tooth. Many people choose dental implants as they feel more confident when they can smile and display natural-looking teeth. Dental implants are designed to last for a very long time, as we discuss in another blog post. With good care, a dental implant could last 25 years or longer. Alternatives to dental implants usually need to be replaced within 5 to 10 years, which makes dental implants a good long-term solution. At Pembroke Dental, we take great pride in our dental implants. Give us a call on 01 668 3242 to arrange an initial consultation. We’ll talk you through the whole process and outline the advantages and disadvantages of each treatment option.